Hello ... Hello ... my old friends ... It's great to see you once again! 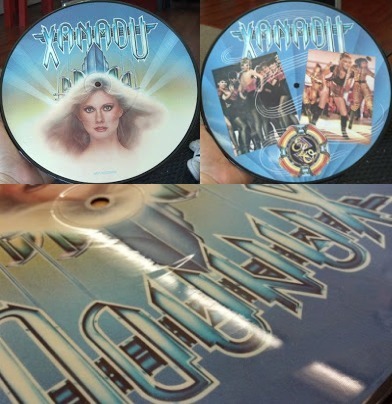 Quite by accident, whilst surfing over on eBay the other night, I discovered that a mega rare copy of the 33 1/3 RPM, 10" promo picture disc of "Xanadu"  is up for auction. It started life with a price of $9.99 yesterday and, at the time of writing, is already holding a bid of $530 at the time of writing with six days to go until the auction ends. Both Martin Kinch and Jeff Cooper have informed me that this item was sold for the best part of $5,000 last time making it one of [if not] the most expensive of ELO rarities alongside those 2LP acetates of "Secret Messages" including, of course, "Beatles Forever". "Here’s one that doesn’t show up often ... the 10” picture disc of the track “Xanadu” track featuring Olivia Newton-John singing with Electric Light Orchestra as a backing band. What makes this piece particularly interesting is that it’s not supposed to exist! This copy comes from a friend who worked in the record industry and was given this picture disc as a gift before Olivia ... decided to have the company recall the record because she didn’t like the picture on it! [or so my friend says]. Some internet sources say as few as 31 copies are known to exist, so needless to say, you’re not going to have many chances to get a copy. This copy has been stored in a display case by the original owner since he got it, and I will include the copy for whoever wins the record. The matrix etchings are MC10384; L2315 ... I’ve played both sides to make sure [that] there [are] no major flaws and both sides play through with no major incidents." Neither Yours Truly KJS or ELO Beatles Forever [ELOBF] have deep enough pockets to procure this very scarce item but it surely is of interest to ELO fans and collectors alike that the item is still out there and available - at a price! It'll be interesting to see what the final price turns out to be!